The NASA/ESA Hubble Space Telescope has broken the distance limit for galaxies and uncovered a primordial population of compact and ultra-blue galaxies that have never been seen before. 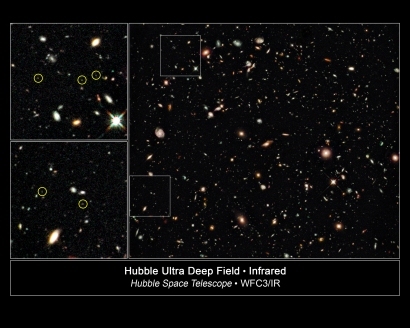 The data from the Hubble's new infrared camera, the Wide Field Camera 3 (WFC3), on the Ultra Deep Field (taken in August 2009) have been analysed by five international teams of astronomers. Some of these early results are being presented by various team members on 6 January 2010, at the 215th meeting of the American Astronomical Society in Washington DC, USA. This is the deepest image of the Universe ever taken in near-infrared light by the NASA/ESA Hubble Space Telescope. Hurray! Good for the Hubble. Thanks for posting that, Hans. One of the international teams is at Edinburgh University. It's good to see them having their say first. Indeed - especially after missing out in the huge rush to be first on the pre-print archive earlier this year! Kath do you the glass prints plate archives? Only way I can explain it. Well I had to go google it since either IE's being difficult or that link is no longer working... nice picture. Sorry - we publish papers in scientific journals, but also have an online archive for pre-prints - pre-publication copies of the paper. Sometimes we wait until they've been accepted by a journal before putting them on the archive, and sometimes they go up even earlier, as soon as a paper is written! That's often frowned on, unless it's a really, really important subject. When the data for these papers arrived back from Hubble, the first teams got their results on the pre-print archive within just a few days!! [Most likely, they wrote the paper before getting the data, with different possible interpretations and implications depending on whether they saw more or fewer galaxies than predicted by the theorists - then just chose the text to fit!] Once the first team had their science out, the rest followed over the next week or so. Not necessarily a bad thing, as you can spend a bit more time being certain the science is perfect. Either way, most of the big papers were impressively swift to come out, and they all had some exciting results. Hans...this was very interesting to see and thanks to Steven, to read about. It's a shame that we don't get to hear more about these kinds of happenings on the evening news!!! Well, maybe we should post more in here if people are interested. If you do find where you have parked it, please hop on over and pick me up, dear! Personnally i think its great we have a place like this, Its great to share Images and know what everyone else is doing, and maybe get a sneak preview of papers? Hans could a protected area be done for that? Technically we could, Oldwolf. But would there be enough interest, enough people using it? If I were a professional scientist I'd be pretty careful with my data. Let's first try and generate more interest in general for this and we'll see what pops up, OK? That's because the science stories, unless they are major discoveries or controversial in some way, usually get bumped from the news bulletins by something else. However, now that nearly all broadcasters and newspapers have web sites, you can often find the minor science stories collected there. For example, the BBC has a "Science and Nature" page: http://www.bbc.co.uk/science/. If you check this regularly, and follow up the "related links" you can find all kinds of stories. On the other hand, if you want to hear science stories straight from the source when they happen you can sign up to a mailing list. NASA have a mailing list (snglist) which you can sign up to here. You can also sign up for email alerts from spaceweather.com here. The site http://www.heavens-above.com/ can also be used to find out what is visible in the sky at your location at any time. It's good for predicting international space station events, for example. Hmm. I don't think having a protected area for the early publication of data or papers would work in the way suggested. Professional data is usually protected for a period of time after acquisition - nobody is allowed access during that period except the project team who requested it. There are also rigorous procedures that prevent results being published until peer reviewed. After that, the arXiv site is already there to give sneak previews. Previews of results are normally given to professional audiences in the form of seminar or conference presentations. Often these presentations are in the public domain (although some conferences take the copyright so they can publish proceedings), in which case they could be published here or linked to without the need for a protected area. I've recently started "following" NASA, ESO and ESA on twitter and am sniffing out other good organsiations to add. My stuff's not so interesting for people outside of my area (I think my pictures are pretty but that's more because they're !results! ) but I know that I have to be careful because of potential patent stuff. There's New Scientist too (I don't have the web address handy). Please do, for even if I can't see them that good, I still love reading about them.